I designed this program with you and your horse in mind. 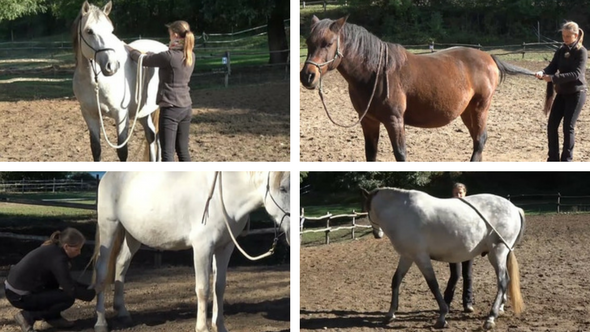 In this Groundwork Program I first take you step by step through the whole Basic Groundwork of Horsefulness Training to then proceed with Continued Groundwork. And yes, it would have been easy to show you all the exercises with horses who are perfectly trained, selected and perform everything flawless. But, let's be honest, what good does that do for you at home? I chose to make the program with a different range of horses: young, old, sensitive, flegmatic, well trained, less trained. So I'm not only showing horses who already know the exercises and are trained into perfection, because that's not the situation you have at home. You get to see how I teach the horse step by step, just as you will do at home. I will show you how you can do all this with as less aids and pressure as possible. That way your horse will be able to stay calm and relaxed. And, when your horse is relaxed, you are more relaxed, everthing is more fun to do and you horse learns much better and faster. You're never on your own! The true power of this program is found in the fact you have the possibility to ask unlimited questions. Below every video, pdf, ... you can ask your questions. I personally answer your questions very fast and I keep helping you until you're satisfied. If necessary you can even send me a video so I can help you even better. For who is this program the right choice? 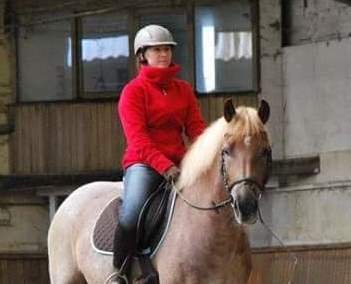 If you are looking for a horse that is safe, happy, coöperative and confident during training. If you want to prepare your horse for Gymnastic Groundwork and/or Riding in the best possible way. If you want to give your horse a lot of variation in training, so your horse stays fit on every level: physical, mental, emotional and spiritual. If you want to learn to train with as less pressure as possible, with feel, respect and mindfulness. 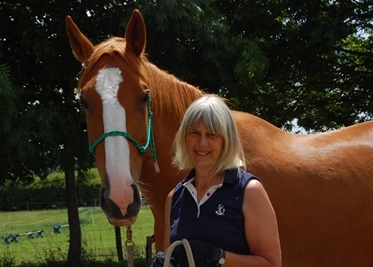 If you want to develop yourself to be the best possible trainer and companion for your horse! I was frustrated, I didn't know what to do. And I was fearful because he sometimes attacked people. 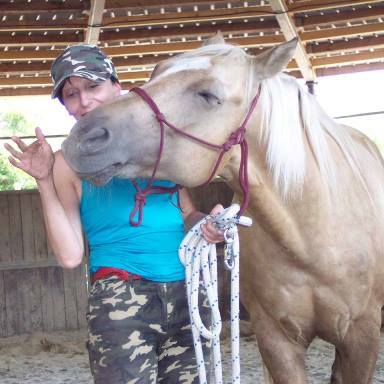 By applying Horsefulness Training Palomino is another horse. He became my best friend. He needed a person who could understand who he is and his playful spirit. Now he can play with me for hours (with a ball, obstacles, and so on…). He follows me and he askes me to play... Yesterday he helped me to groom another horse, while before he was so aggressive, also with other horses! Thanks to the Horsefulness Groundwork Program my horse Otis and me found a way to communicate with each other! I have done the groundwork as Karine brings with one very nervous horse and it has helped so much. The "here and now" technique also helped and now I am practicing the body scan. What’s great about your whole program is having no time limit. If something's not working then you can go back and repeat until you are ready again to move on. You don't feel you have to rush through to get it done in a certain time frame. Can't thank you enough for this amazing program, your quick response to any questions and dedication to sharing your work .Big thank you! Karine is a wonderful trainer and her method of training encompasses all learning styles. Being able to watch her videos over and over again is the perfect way to learn. Every time you watch one again you see another detail. Her explanations are extremely clear and no detail is left out, so you end up with a thorough understanding of what you are trying to achieve and how to achieve it. Enormous care and a lot of time has gone into producing this training programme. Over the years I have had lessons from various different instructors and have often ended up thinking “that was a waste of £45” or whatever it cost. Not because the teachers were bad teachers but because my learning style is such that I need to really understand what I am trying to do. Just telling me to do something doesn’t work. This for me is why Karine’s training is so good. She explains in depth what she is aiming to achieve and breaks the training down into simple steps. It works! I also deeply appreciate the way she is so respectful to the horses she is training. It is very clear that she likes them. She takes their different personalities into consideration and fine tunes her training accordingly to suit their learning styles. It is such a refreshing contrast to many people who want a horse to do what they want it to do and at a pace that they dictate. Karine’s methods allow the horse to develop as an individual and at its own pace. The Horsefulness training has given me “permission” to bring my young horse on at a pace which suits us both. Doing this training has changed the prospect of training my young horse from a burden to an utter joy. 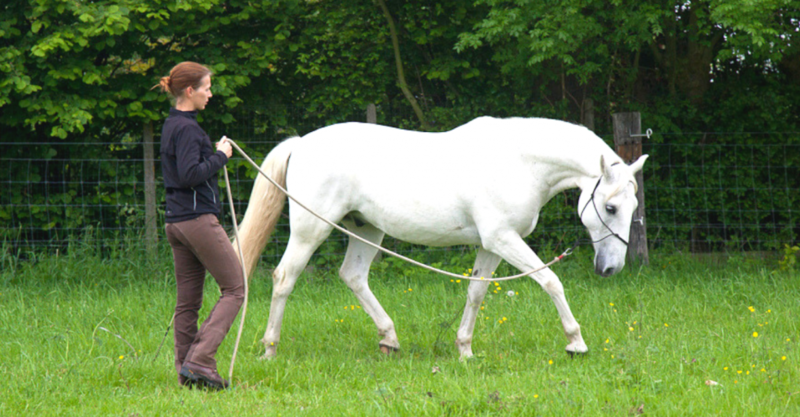 of the basic Groundwork exercises of Horsefulness Training. How to teach your horse "the grazing signal"
Why "low" is better then "high"
When you and your horse master the Basic Groundwork, you're ready to take things further and start with the Continued Groundwork. At this point the complete Basic Groundwork (as shown above) is available for you inside the program. The Continued Groundwork is being released to the program over the course of 2018. As we speak the Obstacle Training Course is being added. The other courses will follow soon. When you join now, this will be added to your account totally for free. That's my way of thanking you for being there from the start! And more courses are coming soon! At this point the complete Basic Groundwork is available for you inside the program. Extra bonus "find your feel"
The Find your Feel Series is a course that puts the focus entirely on you as a trainer, teaching you how you can FIND YOUR FEEL so you can really FEEL TOWARDS the horse in whatever you are doing together. Finding your feel with your horse will enable you to train in softness and in connection. This feels fantastic: for you AND for your horse! Finding Your Feel opens the door to your intuïtion, your intuïton will start to talk to you, letting you know what your horse needs and how it feels deep inside. Experiencing the difference between "being in your head" versus "being in your body" and how you can connect with your body and ground yourself wherever you are and whatever you are doing in only a few seconds (and yes, also if you always had difficulties with this!!!). Your horse will LOVE you for this! The Contact Game: learning to feel the difference between “being out of the contact” and “in the contact”. 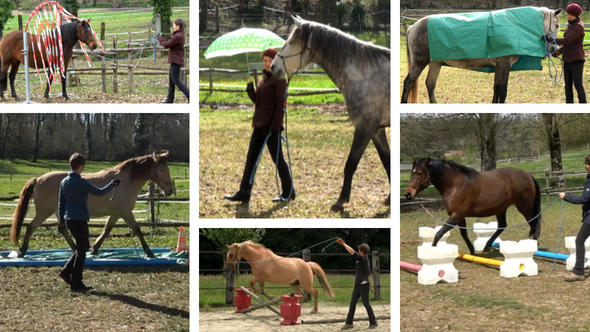 The Contact Game will enable you to really FEEL TOWARDS the horse, not only physical but also energetical. Only if you can feel towards your horse, your horse can feel towards you too, that's why the Contact Game is invaluable if you want to connect on the deepest level with your horse! P.S. The Find Your Feel Series will be updated and expanded very soon. As a member of the Groundwork Program, you will get this powerful course for free! You’re taken by the hand, following the clear and step by step approach to make groundwork with your horse a success and enjoyable experience. Everything is shown into detail using Full HD videos. Next to the possibilty to ask all your questions inside the program and private Facebook group, you can join a live Q&A session 3 times a year. This can also be a theme webinar. Every session is recorded and available inside the program. Without paying anything extra, more (to be released soon) Continued Groundwork such as groundwork with the neckrope, trailer loading, double long lines, traffic training and preparing your horse for riding will be added to your account. Discover the missing link to being a calm, aware and present companion for your horse. 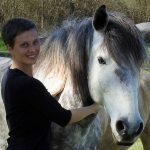 In this program you get in-depth and tailored guidance for you you and your horse. I personally see into every question and under normal conditions you have a response within 3 days (mostly even the same day). You have access to a great Facebook community of like minded people where you can interact with each other and me, to inspire and motivate each other, to ask questions and discuss everything you want about Horsefulness Training and horses in general. The program is mobile friendly so you can access it using your mobile devices. This is great if you want to take the program right where your horse is! The program is yours for life so there’s no need to hurry once you’re in. Also, you can’t loose it or break it. It’s there online and you can access it 24/7. Or make use of split payments. We offer a 6x and a 12x installment plan. Click one of the payment options below to find out more. If you want to combine this Groundwork course with the Horsefulness Liberty training Program, then I can offer you a EXTRA SPECIAL deal. As always this program also comes with a 10 day "not happy, money back"-guarantee. I want you to be happy with what you find inside the program, I only want happy members. So if for any reason you are not satisfied, just let me know within the 10 days after purchase and I'll be happy to give you a 100% refund. 4.82 on a scale of 0 to 5, for the personal support and guidance that comes with this program. 98% would recommend this online program to a friend! Can I spread my investment? Yes, we offer a 6 or 12 months installment plan so you can spread your investment over 6 or 12 months. Are the Continued Groundwork courses really free? Yes! As we speak, the Obstacle training course already fully available and the Double Long Lines course as well. The remaining courses will follow over the course of 2019. You will not have to pay extra for these courses. I don't know anything about groundwork yet, is it possible then to follow this program? Yes it is! The program is designed in such a way that everything is explained and showed from A to Z, so it’s clear what you have to do, and how you have to do it. I would say: if you never done groundwork, then this is the moment to start, because of all the advantages it will bring you and your horse. I love to teach novices groundwork as much as I love to coach experienced trainers how to improve their groundwork skills. My horse is still young, can I already start with Groundwork? Is there a trial period with this program? Yes. We offer a 10 days guarantee, because I want you to be satisfied with your purchase. This means you can try the program for 10 days and decide if you want to continue or not. So there is no risk involved. If you don’t like it, just let me know within 10 days after purchase and you get a 100% refund no questions asked. Is this an online course that starts on a specific date? No, when you sign up, you can start whenever you like, even if that’s only in 1 month or later. You have lifetime access and you can keep asking your questions below every video as well as in the private Facebook group. Just take your time, because I’m always there to help you when you need me. Where will I be able to ask my questions and can I send in videos? And yes, you can send in video’s. If you get stuck or it’s difficult to explain to me what’s happing during training, then a video is very helpful. ‘Cause then I’m able to see with my own eyes what the problem is exactly, and I can give you even better feedback and advice. It's time for you and your horse to take the next step! I'm ready to help you and your horse and I'll guide you whenever you're facing a challenge.